The White House has suspended the credentials of CNN’s chief White House correspondent hours after a testy exchange with President Donald Trump. 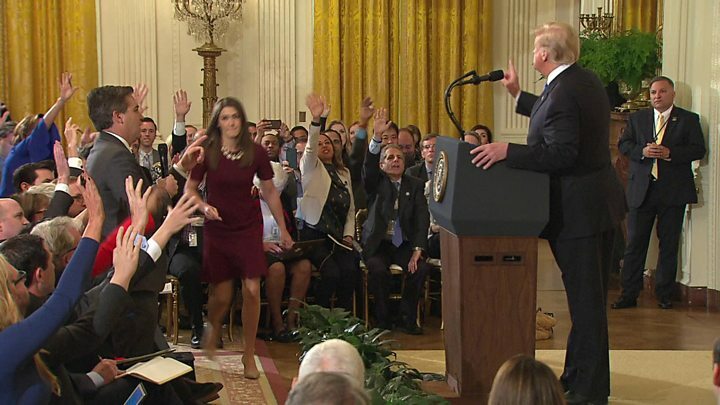 Jim Acosta was asking a question at a news conference on Wednesday when a White House worker tried to grab the microphone from his hands. Press secretary Sarah Huckerbee Sanders said access was removed because he had put “his hands on a young woman”. 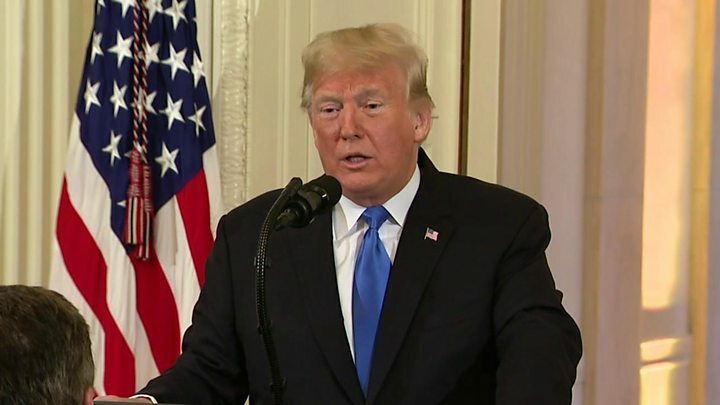 President Trump had been giving his response to the mid-term elections, which saw his Republican party lose control of the lower house of Congress but gain seats in the upper house. What happened at the news conference? During a question-and-answer session, Mr Acosta challenged Mr Trump’s use of the word “invasion” to describe a migrant caravan heading to the US from Central America. He also challenged him over an anti-immigration advert that was widely seen as racist. When Mr Acosta tried to ask a question about the Russia investigation into alleged interference in the 2016 presidential campaign, Mr Trump told him repeatedly “that’s enough” and “put down the mic”. A female staff member attempted to take the microphone from the journalist, and Mr Acosta resisted handing it over telling her at one point “pardon me ma’am”. Mr Trump walked away from the podium and returned to say: “CNN should be ashamed of itself having you working for them. You are a rude, terrible person.” He added: “The way you treat Sarah Huckerbee is horrible,” without explaining why. Another journalist spoke up in Mr Acosta’s defence, calling him a “diligent reporter”. Mr Trump fired back, “well I’m not a big fan of yours either,” sparking laughter from members of the audience. Ms Sanders, in a statement posted in a Twitter thread, said the White House would “never tolerate a reporter placing his hands on a young woman just trying to do her job”. “The fact that CNN is proud of the way their employee behaved is not only disgusting, it’s an example of their outrageous disregard for everyone, including young women, who work in this Administration,” she said. The press secretary later shared a zoomed in clip of the incident, which observers say is a doctored video originally posted by right-wing conspiracy theorist Paul Joseph Watson. Mr Acosta posted a tweet saying he was stopped by the Secret Service from entering White House grounds. What did Acosta and CNN say? CNN issued a statement on Twitter saying the ban was “in retaliation for [Jim Acosta’s] challenging questions”. The White House Correspondents’ Association, which represents the press corps at the presidential residence, urged the administration to reverse “this weak and misguided action”. Other members of the White House press corps have also come to Mr Acosta’s defence. New York Times’ Peter Baker said he had been covering the White House since 1996 and had never known a reporter lose their credentials in this way.